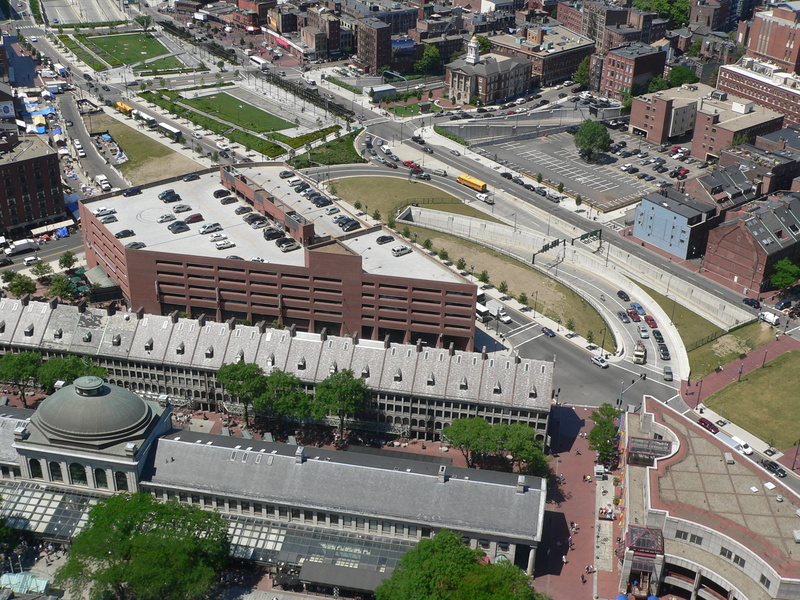 Aerial photo of the red brick Dock Square Garage sandwiched between Quincy Market and the Rose Kennedy Greenway. Photo by NewtonCourt. This is the text of the letter I sent on April 9, 2018 to Michael Rooney, Senior Project Manager, Boston Planning and Development Agency regarding the Dock Square Garage redevelopment project. More information about the project is available here. The Dock Square Garage is a 1970s throwback to a time when vacant lots and garages lined both sides of the elevated highway. With the highway gone and Greenway in bloom, these lots are now contributing to the revival of Boston by helping to meet the considerable demand for housing, offices, and retail/restaurants. These changes are welcome and overdue, but this proposal is deficient. The applicant employs fashionable sustainability language (LEED certifiable construction, adherence to Smart Growth standards, etc.) and claims that it will remedy an “inactive edge in an otherwise active corridor” by “invigorat[ing] the site itself and enhanc[ing] the experience of the surrounding area.” These are grand words, but they do not match the proposal. Ground floor activation through retail/restaurant uses is essential to invigorating the streetscape. However, the applicant does not propose any new ground floor uses, and actually proposes to shrink the current restaurant by 46 percent. If built as proposed, people walking along Clinton, North, and John F. Fitzgerald Surface Road will still confront a deadening, multi-story garage wall—no matter the style of new cladding or window boxes proposed to cover the existing façade. Leaving the ground floor inactive is not part of the City’s vision for the parcel. The City identified the intersection of Clinton and the Surface Road as a “critical juncture” that needs a restaurant/retail use in this parcel “to strengthen connectivity between the parks and Quincy Market.” Unfortunately, the applicant proposes no such use and instead retains a three lane garage entrance that is inhospitable to people walking along Clinton Street. Further, the applicant argues that bisecting the pedestrian plaza at the intersection of North and Clinton Streets with a new residential pick-up/drop-off lane will somehow make the space “more welcoming and usable to the public” as opposed to less accessible and encircled by vehicular traffic. The reason for failing to design an active ground floor for the building is that the applicant intends to retain 682 of its existing 698 parking spaces. This substantial number of spaces has little connection to the 195 residences proposed to top the structure. As even the applicant notes in the Project Notification Form, the City has set a maximum of 0.5 to 1 parking spaces per residence in this district. Even if the residences claimed the 195 spots at the high-end of that range, the 8,000 sq. ft. restaurant would certainly not need the remaining 487 parking spaces. Surely, a creative engineer could find a way to squeeze in active ground floor uses—even if the bays are shallow—at the cost of some of those surplus parking spaces. In particular, sacrificing a handful of parking spaces on the Surface Road side of the garage would leave room for retail/restaurant space(s) to front the Greenway. The partially below grade and unused space at the corner of North Street and Surface Road should also serve as a retail/restaurant space. In addition, the existing restaurant needs a second entrance capping Blackstone Street to further maximize activity on the North Street side of the building. These are small ways to make preserving nearly 700 parking spaces more palatable. Still, reducing the number of parking spaces downtown, where alternative transportation options are abundant, remains an essential way to decrease greenhouse gas emissions. According to a November 2017 article in the Boston Globe, transportation emissions now account for 40 percent of our Commonwealth’s greenhouse gas emissions. Massachusetts has set goals of reducing greenhouse gas emissions by 25 percent below 1990 levels by 2020 and by 80 percent by 2050. Governor Baker and Mayor Walsh have committed to these goals and have both signed onto the Paris Climate Agreement. The City of Boston has also called for “dramatic mode shifts” away from cars and towards sustainable transportation in Go Boston 2030. Building to LEED standards is not enough, because retaining a tremendous number of parking spaces will simply encourage continued car usage and outweigh any benefits from the efficient energy usage of the building itself. Moreover, the recent flooding in the Seaport, North End, and West End demonstrate that climate change is occurring now and that meaningful action to discourage driving is needed today. Reject the plans to retain the wide garage entrance and bisect the pedestrian plaza with a new car drop-off lane. The proposed height is acceptable in a downtown neighborhood and including residences that range in size from studios to four bedrooms is welcome. However, without substantial changes to the ground floor, the City must oppose this project. Greenway District Planning Study Use and Development Guidelines, August 2010. Available here.